From varying attribution models to offsetting overall costs, these 27 marketers share how to determine whether a content marketing strategy is paying off. Are you spending thousands of dollars on a content marketing strategy but are still unsure as to whether your investment is paying off? You’re not the only one; 38% of marketers cite measuring content effectiveness as one of their greatest challenges. But what’s causing the difficulty? That doesn’t come as a shock, because calculating the ROI of a single piece of content isn’t clear-cut–especially because B2B audiences consume several pieces of content before deciding to purchase (between 3 and 5 pieces, on average). How can you accurately spread attribution across the URLs a customer visited before they bought, and determine which singular piece of content triggered that purchase? 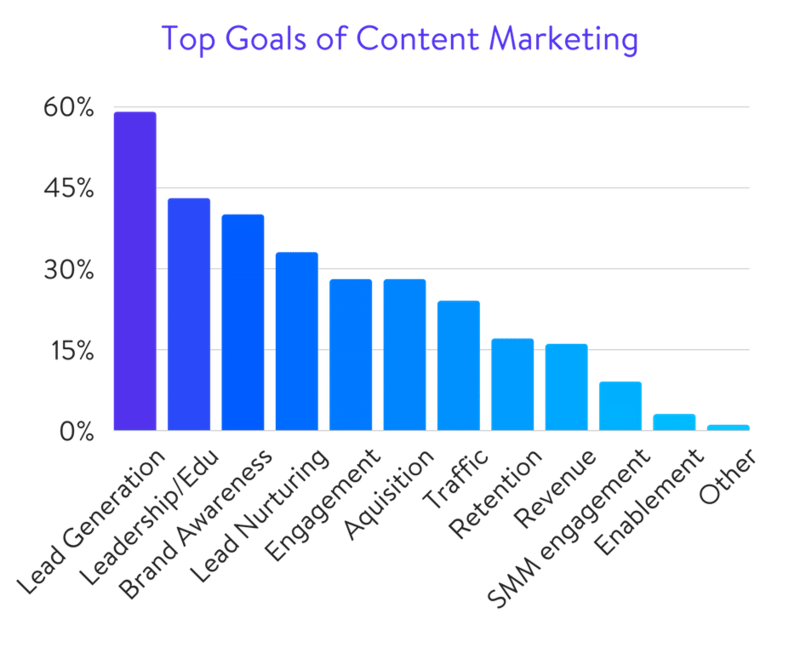 We asked 27 experts (who track their content marketing ROI) to share their advice. From strategies to measure, metrics to track and software to assist with calculations, here’s what they said. Editor’s note: The path to ROI starts with understanding performance. Want an easier way to track and analyze the specific sources driving traffic to your website? 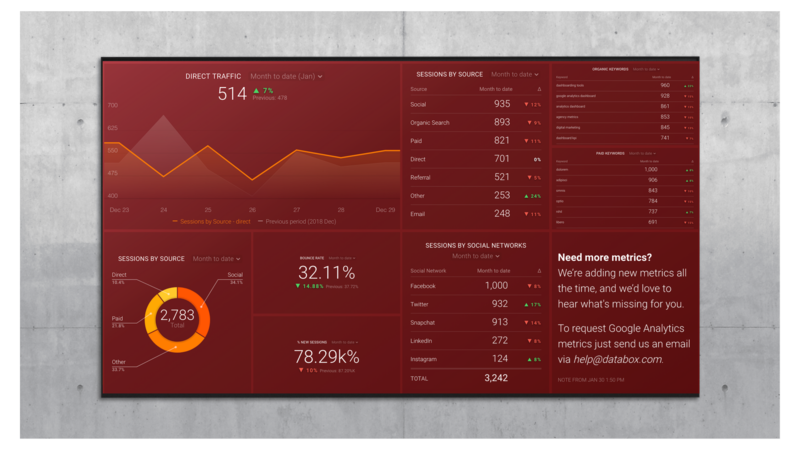 Well, all you need is Google Analytics and this free dashboard. Once you connect, you’ll see instant visualizations of sessions by source, sessions by social network, and more. Sure, ROI technically means return on investment. But what exactly does ‘return’ mean? Typically, a campaign is considered as having a “high ROI” if you’re generating more money than you’re spending on it. Now you know what ROI you’re measuring, it’s important to understand which metrics can help you calculate it. But not all marketers recommend tracking ROI as strictly as Brandon. In a nutshell: The metrics you chose to track ROI should be somehow related to earning more money. Unique visitors, lead magnet downloads and conversions can all play a role, so you’ll need to hone in on exactly which metrics eventually result in paying customers if you’re accurately measuring the return on your content investment. You’ve got a list of metrics you’re thinking of measuring, but where should you collect the data from? Simple metrics, such as the number of conversions or conversion rate, can be easy to find-as explained by Kiyo Wiesnoski of Adlava: “If the goal is strictly getting users to directly buy something, that’s straightforward enough to measure”. She’s right: Content marketing can increase overall brand awareness, improve organic rankings, and build upon the campaigns you’re using advertising for. That’s why you’ll need to measure key metrics across several platforms–such as CPC on Facebook Ads, LinkedIn campaigns and Google Ads accounts. Remember how we mentioned ROI is a simple equation? “In a nutshell, the best way to prove ROI is to determine how much revenue comes in via content marketing efforts, and subtract all the inputs (dollars spent on advertising, salaries for freelancers, staff writers, etc. )”, shares Catherine Giese of Fundera. Ampmycontent‘s Daniel Daines-Hutt also uses this process to calculate ROI at his company. When you’re running an eCommerce business, you’ll be no stranger to CAC and LTV metrics. Do you have a handful of high-value customers that can be contacted through a quick email? But Andrew thinks this simplistic approach to measuring the ROI of content marketing can still work for larger businesses. “For us, content marketing is all about reach and conversions”, says Blogging.org‘s Zac Johnson. But how do you understand the value of traffic you’re driving to your website content? “UTM codes allow you to tag inbound traffic from referral, paid, or social sites”, explains Joe Sloan of Advice Media. Fancy getting started with UTM codes? Head over to Google’s Campaign URL Builder, and set the parameters you’ll use to measure the success of each campaign. While the overall ROI of your business’ content marketing strategy can be calculated by offsetting direct costs, there are other nifty tricks to dive deeper into your results. “How much pipeline and revenue can be attached to content, whether it be first touch, last touch or something in between? How many customers engaged with a piece (or pieces) of content before they signed? How many opportunities came into the funnel by engaging with a piece of content? “The most effective way to prove the ROI of content marketing is to ensure you have closed-loop reporting in place that can attribute closed sales to engagement with your content”, explains Jennifer Lux of Lynton Web. Attribution models can make this possible. They’re rules that determine which page should be credited for conversions (mainly sales). First touch: The first page a paying customer visited in their journey. Multi-touch: The combination of pages a paying customer visited before purchasing. Last-touch: The final page a paying customer visited before hitting “purchase”. …including Amanda Nielsen, who forms part of the New Breed marketing department. She’s not the only one using buyer journeys to determine the most appropriate attribution models to track content marketing ROI. That doesn’t mean multi-touch attribution is the only way forwards, though. But Brand Chemistry‘s Christabelle Tani doesn’t think which attribution model you’re choosing really matters. Great job! 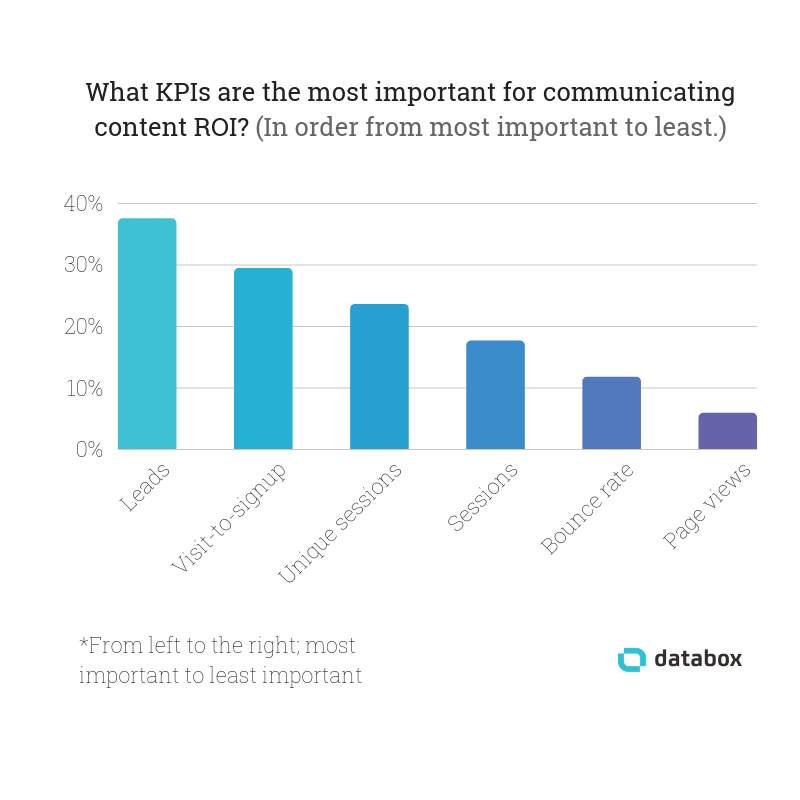 You know the theory behind measuring the ROI of your content marketing strategy. But you want to make your job easy, right? Lupo Digital‘s Glenn Miller also uses HubSpot software to track content marketing ROI. “As your content marketing strategy matures, measuring the impact of content along the buyer’s journey in a multi-attribution model can provide deeper insights into which pieces of content are most effective not only in a prospect’s initial buying phase but along their path to purchase”, explains LyntonWeb‘s Jennifer Lux. “If you work in a call heavy industry, CallRail is a great option for attributing calls to your content”, says Market 8‘s Brian Schofield. To accurately monitor ROI, you’ll need to accurately track the activity happening on your website. Are you using affiliate links on your website to generate more cash? But even if you’re not participating in affiliate marketing, the Pretty Links plugin can still track which links are being clicked–allowing you to understand the effectiveness of your linking strategy. You know how to track ROI, and the software you’ll need to measure it accurately. But if you log into your dashboard and aren’t happy with the result, what happens next? These four content marketers share their best tip for improving ROI, so you don’t have to pour your cash into a strategy that’s failing to see results. Granted, the term low-hanging fruit ranks pretty high on the “marketing jargon” list. You could take advantage of customers ready to convert again and boost the results you’re getting from your content strategy, by targeting this low-hanging fruit. “The single biggest way we have built our presence is through paid ads to content pages about different kettlebell movements, expert advice and signing up for weekly workouts to receive in your email inbox”, explains Jay Perkins of Kettlebell Kings. Ready to start driving ROI for your content strategy? 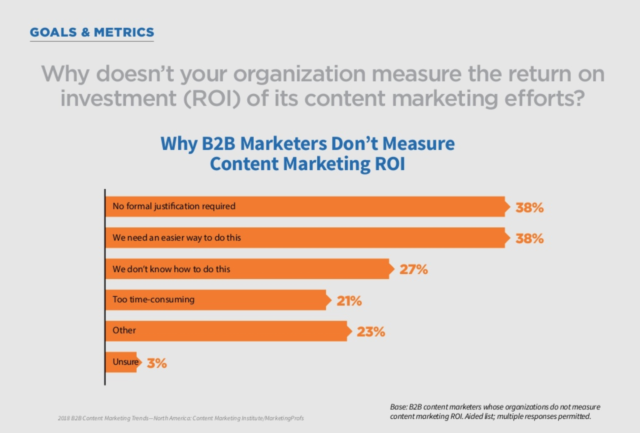 Accurately measuring the return on your content marketing isn’t an easy job. Elise Dopson Elise Dopson is a freelance B2B writer for SaaS and marketing companies. 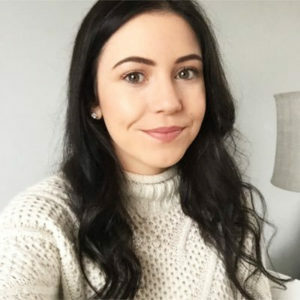 With a focus on data-driven ideas that truly provide value, she helps brands to get noticed online--and drive targeted website visitors that transform into raving fans. Join 25,547 subscribers to receive latest posts.